San Rafael Elks Lodge #1108, Corporate Visions, and donor Bob Gordon, acting together on our shared focus on our community's youth, have donated 86 bikes to 4th graders in San Rafael Public Schools. 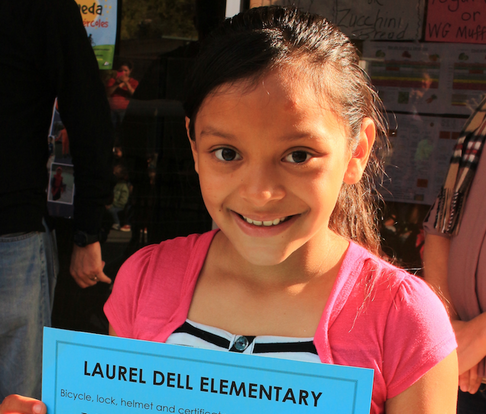 This ongoing project includes a bike, helmet, lock and a safety class for each kid. Fourth grade students are selected based on their short essays on what they would do with a bike, how they give back to their community, and their good attitude and leadership at school. Our Lodge's donation, over 30 bikes, has been made with the assistance from Elks National Foundation (ENF) Grant Money and donations from members. The enthusiasm and joy that these kids express when receiving their bike is wonderful and contagious. For these moments and opportunities, we are grateful.